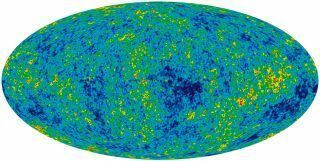 The cosmic microwave background, depicted here from nine years of data from NASA's WMAP telescope, was the key to proving the validity of the Big Bang theory. It's not often that you can get promoted, commended and even awarded for failing to do your job. Usually, it's the exact opposite. So how exactly did Arno Penzias and Robert Wilson — two who-the-heck-are-those-guys at Bell Labs in the 1960s — win a free trip to Stockholm and a shiny golden Nobel medal? First, a little setup. At the time, the Big Bang theory wasn't the high-and-mighty, universal champ model to explain the end-all and be-all in the cosmos that it is today. Far from it: while a strong contender for the title, it had some powerful rivals, especially the Steady State theory. With this mind-blowing knowledge, theorists hurried to come up with explanations. In the heady days of the '20s and '30s, two models emerged. In one corner: The Big Bang (although it didn't get that cool name until later), which posited that the universe used to be small, hot and very dense, and over time has mellowed out to become the staid, mature character we know and love today. It was a pretty simple, and pretty popular, idea. For a few decades, these two theories wouldn't budge. The Big Bang had some slight advantages when it came to real-world observations, but couldn't explain everything. At the time, cosmology (the study of the entire universe as a whole) wasn't even really its own scientific discipline; it was just a side hobby for otherwise reasonable astronomers. Folks were much more interested in solar nuclear physics and white dwarfs and other cool stuff. Without a lot of additional brainpower or telescope time, there simply wasn't enough data to sway our understanding to Big Bang or the Steady State conclusively. But a few physicists had started to make some interesting predictions regarding the Big Bang theory. If the universe was hot and dense a long time ago, then it must have been a plasma: a state of matter where all the electrons are ripped from their nuclei and swim around freely. But at some point in that early state, the universe must have cooled to the point that stable atoms could form. Instead of being ripped off violently by some high-energy bit of light, electrons could snuggle up safely next to protons and form the first hydrogen. That light should still permeate the universe today, cooled down from its rambunctious childhood to just a few calm and collected degrees above absolute zero — putting it in the microwave band. "Hmmmm," these physicists reasoned, "we should be able to…you know, see it. Maybe we should build a microwave detector or something?" Enter a couple jokers from Bell Labs. After successfully building a fancy new microwave detector — unbeknownst to most other scientists — Penzias and Wilson had a problem. No matter what, they couldn't get rid of a constant background hiss. Point it at a different part of the sky? Nope, still there. Wait a few weeks? Nope, still there. Ask the nearby Army base if they were doing anything fancy? Nope, still there. Scrape off all the pigeon poop? Nope, still there. They had one job — to get the darn antenna to work right — and they couldn't do it. No matter what, the sky seemed to be filled with microwave radiation, just a few degrees Kelvin above absolute zero. A cosmic microwave background, if you will. They eventually got hooked up with the physicists studying the early universe, and both groups came to the same conclusion: The errant signal they were detecting might possibly be the leftover light from the early universe. But who got The Big Prize? The scientists who had labored over decades to predict the signal and start to investigate how to detect it — or the two random dudes from Bell Labs? The discovery of the cosmic microwave background sent ripples of excitement through the scientific community. Cosmology came into its own as a full-fledged scientific discipline. The universe was different in the past, and will be different in the future. It became experimentally clear that things change — at the very largest scales — with time. And the Big Bang theory had its first major piece of evidence. That's what matters most: if you want to sway a skeptical scientific community, you can begin and end with the evidence. Before 1964, we had no reason to believe the Big Bang theory. But the universe itself, in a subtle whisper of microwaves, is telling us we ought to. Learn more by listening to the episode "What is the Cosmic Microwave Background?" on the Ask A Spaceman podcast, available on iTunes and on the web at http://www.askaspaceman.com. Thanks to Arlington T., Jeffrey B., Edward J., Jason A., Ernie J., Rea N., Chris L. and Randy B.for the questions that led to this piece! Ask your own question on Twitter using #AskASpaceman or by following Paul @PaulMattSutter and facebook.com/PaulMattSutter. Follow us @Spacedotcom, Facebook and Google+. Original article on Space.com.